Make your neighbours Green with envy. 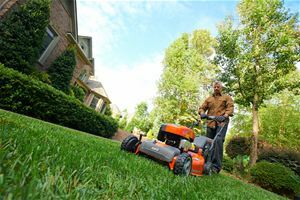 New AWD and zero-turn mowers from Husqvarna help homeowners landscape like the pros. For Canadians looking to flaunt their lawn-care skills, Husqvarna is making it easier than ever this spring with its new lineup of all-wheel drive and zero-turn mowers. Homeowners can maintain their lawns like the pros thanks to the power and performance of Husqvarna’s professional-grade tools. The Z200 series features a new fabricated deck that offers the cut quality and performance of a stamped deck without sacrificing durability. Select models are also equipped with SmartSwitch™ technology, an innovative operator interface offering one-touch starting, real-time feedback and keyless security. For homeowners working with hilly, uneven terrain, the all-wheel drive series offers balance and power to all four wheels to tackle even the toughest jobs. Having the right tools is only part of the equation for maintaining the healthiest lawn. Knowing the Canadian climate poses many challenges for lawn care, Husqvarna is partnering with landscaping expert Scott Duff, owner of Aura Landscaping based in St. Catharines, Ontario. Duff has tips, tricks and tool recommendations for growing and maintaining a better lawn. Always check your equipment before you begin. If you didn’t drain the fuel from your machines prior to storage, be sure to replace it now and clean your equipment to prevent any chain, belt or blade issues. Also check the filters and spark plug to ensure the machine is running at peak performance. We all need a fresh start sometimes, even our lawns. Start the season right by clearing away all winter debris like salt, leaves, sticks and pet waste. Duff uses the Husqvarna 125B blower for a speedy cleanup as it features a well-balance design making it easy for homeowners to operate. Duff then gives the lawn a deep raking to remove thatch and dying grass blades to help promote growth. It also breaks up those heavy matted patches that lead to mould. Aerating allows oxygen to get to the roots, which promotes a healthy lawn and results in vigorous growth. It also allows for improved drainage so you don’t end up with a small lake in your backyard. Choosing the right type of grass for your environment is key. For example, homeowners with kids may look to use Ryegrass, a good selection for home lawns, sports fields and high traffic areas, such as playgrounds. On the other hand, homeowners looking for a more lush lawn should consider Bluegrass. It has a nice colour, texture, can be easily established from seed, forming one of the highest quality lawns and is good for homes, parks, golf courses. The chemistry of your soil plays a large role in the development of a greener lawn. A simple soil test will determine the pH level and establish which nutrients are needed to turn your lawn’s frown upside down. Test multiple areas to ensure an accurate benchmark. There are kits out there, or I always recommend hiring a professional to help. Mowing in the same direction every time can damage the grass blade which leads to ruts and bare patches. Be sure to change directions and even try cutting diagonally to achieve a cleaner cut. It’s also important to select the right mower for your property. The HU800AWD mower provides optimum traction on hills and wet grass. For additional information or to locate your nearest Husqvarna dealer - Novlan Bros. Sales Ltd. Paradise Hill. 1. PROFESSIONAL SAWS Chainsaws with maximum performance and optimum ergonomics. Designed for professional full-time or part-time use. Also available with heated handles. 2. ALL-ROUND SAWS Robust chainsaws. Built as professional saws, but with a slightly lower performance. Designed for part-time use, such as for woodcutting. 3. RECREATIONAL/CONSUMER SAWS Easy to use, small saws designed for home use by “recreational users” who do not use their chainsaw very often. 4. TREE CARE SAWS Developed to be used only by professionals in tree care work. Handling and work techniques for these saws are not addressed in this manual. PROFICIENCY AND EXPERIENCE Choose a smaller chainsaw with a less powerful engine if you are new to chainsaw work. A small saw is more manoeuvrable than a large one. If the chainsaw is too heavy, your hands and arms will tire, which in the long run represents a safety risk. WOOD TYPES AND SIZE OF TREES Choose a larger chainsaw with more power if you want to fell larger trees, especially hardwood. If the model is too small, this will subject the chainsaw to great strain and unnecessary wear. The appropriate length of the guide bar is determined by tree size and to some extent by the level of expertise the user has. If you are used to handling a chainsaw, you should have access to at least two different guide bar lengths, allowing you to vary the guide bar length with different tree sizes. A shorter guide bar weighs less and is easier to manoeuvre when doing limbing work. A longer guide bar is used for larger tree sizes. Visit Novlan Bros to check out our line of chainsaws and equipment! Husqvarna engines are the new generation of power. Tested at sub-zero (<-32°C) environments, they run smoother, longer and more efficiently. 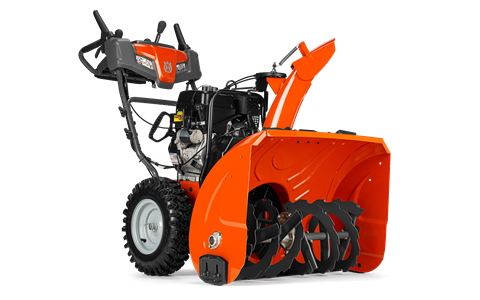 Designed with convenient features, intuitive controls and quick-response safety features, Husqvarna engines blow through the toughest winter conditions. If the Husqvarna GS (Guaranteed to Start) engine will not start on the first or second pull, provided the routine maintenance required in the Operator’s Manual have been performed, and no fuel was left in the snow thrower between seasons as noted in the Operator’s Manual, then the engine is covered for 5 years and will be replaced or repaired at no cost to the consumer.